Six weeks ago, I was talking about our research to a class of eighth graders. One question stayed in the back of my head and the longer I thought about it, the more I thought that it merits a blog post. A girl asked how high the emissions are when we do research and how far we contribute to climate change ourselves, something which I myself have also been thinking about for a while. I found an intriguing article online which analyses the carbon footprint (meaning the total carbon emissions) of the AGU Fall Meeting in 2012, the largest gathering of Earth and Space scientists with 21700 attendants in that year. The author, Judith Parrish, took a representative sample of conference presenters and did quite detailed work to calculate their emissions. Details would be beyond the scope of this blog entry, but I encourage you to read the article. She concluded that the total emissions (only caused by the travel) amounted to 15493 tonnes of CO2, the per-capita emission would then be approximately 710 kg of CO2. 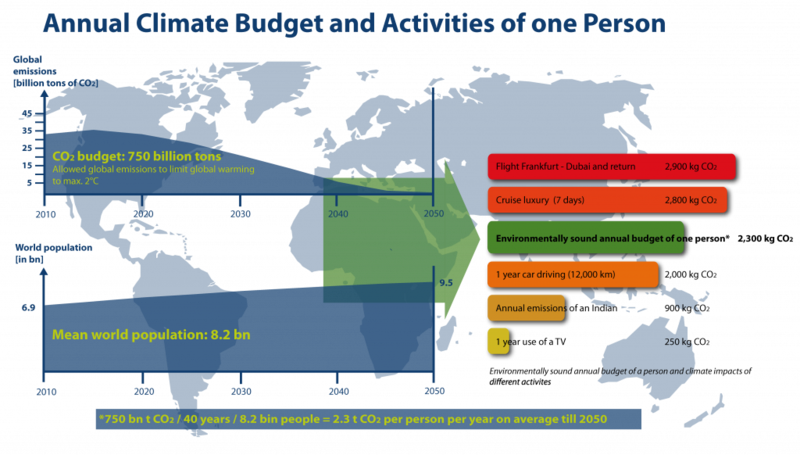 The ‘CO2 budget’ (the maximum emission if the 2°C-degree shall be reached) for each person is about 2300 kg CO2 per year (more detailed information here and here). This means that each attendant used a third of his/her yearly CO2 emission budget for a one-week conference. An analysis of another conference reports 1200 kg of CO2 per attendee. Travel since the start of my PhD in April 2016. Emissions have been calculated using the mean of two emission calculators (atmosfair.de and carbonfootprint.com). Let me continue with a more personal perspective and an estimate of my own carbon footprint caused by my work-related travel (see image to the right). 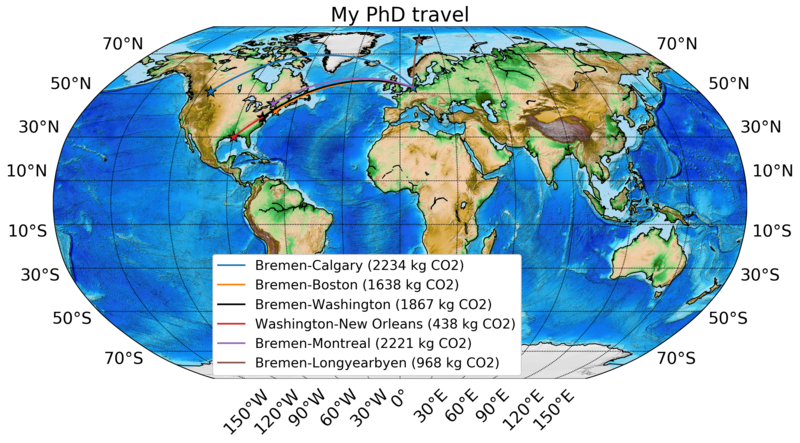 By the end of my PhD, I will have traveled 47937.76 km by plane, almost 1.2 times around the Earth, 436 times from Bremen to Hamburg or 17120 times from my home to the office. This amounts to almost 9400 kg CO2 by the end of my PhD and 3100 kg CO2 per year. By work-related travel alone, I exceeded my personal yearly CO2 budget by 35%. Does this mean that we as climate scientists should cease traveling or limit ourselves to conferences which are in our direct neighbourhood and shift the rest of the cooperation to non-personal interaction? This is a difficult question and I fear I can not provide you with an ultimate answer. International cooperation is one core principle of science. Especially in times of increasing isolationism and nationalism I am amazed every day anew how science bridges national and cultural borders. Further, the climate system is a complex system with a lot of interactions between the single parts. Many of these interactions can only be understood if you know enough about the different parts. Therefore it is of utmost importance for us to be in interaction with colleagues from different disciplines. But does this interaction have to happen in person or could it not be done digitally in our super-technological world? For the talks and poster sessions, this should certainly be possible. But what is considered most important about conferences by most colleagues (and myself) is the possibility for informal exchange in coffee breaks, common dinners and the simple fact of being together physically. Many ideas for studies arise during these informal talks. In her study, Parrish reports that this would be “the main thing they would miss if they could not attend meetings in person”. This is indeed something that can not be simulated by video conferences. It is hard, if not impossible, to quantify the economic value (in terms of saved CO2 by better research) of these informal conversations. However, I believe that it would not be enough to compensate for the enormous environmental impact of conferences. Several ideas exist for mitigating the impact of conferences. One would be a compensation payment which goes into funding sustainable projects and which is offered by the above-mentioned emission calculators and many others. The idea is that you pay enough money to fund measures which counteract the effect of the CO2 which you emitted. This is a good approach to at least mitigate the impact if you can’t avoid the travel. But of course, it would be better to not emit the CO2 in the first place. The compensation payment should not be seen as a modern form of indulgence which buys one the right to not care about CO2 emissions. Further, at least in Bremen it can not be reimbursed when doing business travel and must therefore be paid privately. Another possibility would be to coordinate and colocate conferences such that attendees don’t have to travel multiple times, but for a field as interdisciplinary as ours I consider this difficult. Of course, if it’s not intercontinental travel and the target is reasonably close, many people take the train instead of flying, like all of my colleagues who went to the POLAR2018 conference in Davos (Switzerland) or to the EGU General Assembly in Vienna, which reduces the CO2 emissions by 3 to 6 times (link only in German, sorry). And there is a more consequent approach to the problem: The University of Santa Barbara developed a concept for a nearly carbon-neutral conference. I do not know if such a concept will work. But I think that we who warn about climate change and global warming should give a good example. Therefore, I think it is high time to try and improve on such concepts to eventually overcome the need of fly-in meetings. PS for the German readers: I would love to provide you with a German version. But, hopefully, you all read Lina’s article about why there are postless Mondays from time to time (if not, it’s high time!). I didn’t want to strip you of the joy of a Monday article, but I have some deadlines coming up this and the next weeks and therefore have to postpone the German translation. But it comes, promised! In the meantime, use the chance and practice your English ;-).